Q:Does this favor come personalized? A:This soap favor does not come personalized, you can however personalize it by adding a tag or label. The tag that comes with it says "English Garden"
Q:does each individual soap come in individual boxes? 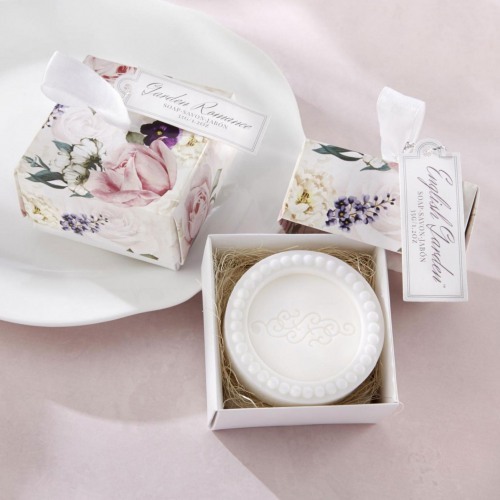 This English garden floral soap favor is a fresh take on wedding and bridal shower favors. The favor box, which features a floral white, pink, green, and navy print, is both pretty and delicate. Plus, the circular soap inside is so refreshing. This is a great practical favor to thank your guests for being part of your special event.